One of the odd friendships in this film was between Royal Tenenbaum, played by Gene Hackman, and Pagoda, played by Kumar Pallana. Just as a side note, Pallana got his start in Wes Anderson's first film, Bottle Rocket, and has since been in all of them except for The Life Aquatic. The story goes that he used to own a coffee shop where Anderson and Owen Wilson hung out. Anyway, in the film we find out that Royal met Pagoda at a Bazaar in Calcutta. Pagoda stabbed him, but then decided to rescue him. They apparently had been together ever since. At one point in the movie, when everything has basically gone wrong, Pagoda stabs him again. "That’s the last time I get knifed by you! You hear me?" are Royal's words as Pagoda helps him up and into a waiting cab. What is it that draws these two together? Why are mismatched friednships such as this so intriguing? My first reaction to that was laughter at such an outrageously untrue statement. If you think about it, however, that is essentially what Royal accomplished. His family was on a destroyed sinking battleship of sorts. None of them had seen each other for years and all of their lives (with the exception, maybe, of Etheline) were in a shambles. Though Royal's motives were certainly not pure to begin with he was able to change all that. We still live in the hangover from Christendom, when churches assumed the culture was Christian, so that all that was needed was to baptize those who had been nurtured by the culture and they would spontaneously do what is Christian. So evangelicals assume that the task is to convert people, Pentecostals assume the task is to be receptive to the power of the Spirit, spiritualists assume the task is to feel the presence of the divine, and liberals assume the task is to articulate a philosophical principle, and then the desire to be good, combined with the obvious meaning of goodness that we all know in the midst of our reasonable culture, will produce good Christians. Yet the culture is not Christian; it is good in parts, and it does have a sense of morality, but it is also imperialist, laced with unconscious racism, infiltrated by belief in the myth of redemptive violence, and driven by enormous concentration of wealth that works consistently to weaken or co-opt all possible critics. Unless we teach a thick and holistic ethic with articulate antibodies against those ideologies, Christians will be co-opted, hijacked, and flown off in untrue directions by the forced of accommodation. Glen H. Stassen, “It is Time to Take Jesus Back: In Celebration of the Fiftieth Anniversary of H. Richard Niebuhr's Christ and Culture,” Journal of the Society of Christian Ethics 23, no. 1 (Spring-Summer 2003): 139. If you haven't watched the movie Rushmore yet you're really missing out. This is possibly the best of the Wes Anderson films. It features Bill Murray as Herman Blume, Jason Schwartzman as the inimitable Max Fischer, and the lovely Olivia Williams as Rosemary Cross, the woman they both fall for. One of the reasons I really like this movie is the unlikely friendship between Blume and Max Fischer. Blume is a rich business owner and Max is a student in high school. Blume has twin boys about the same age as Max. I guess it gives me a sense of hope that two such disparate people are able to help each other. Max and Blume initially fight over Rosemary, but eventually Max ends up helping Blume win her over. What brings Blume and Max together? Someone in our group made the comment that Max is ashamed of where he comes from and Blume is ashamed of where he is. Toward the beginning of the movie, Blume asks Max what his secret is. Max replies, "I don't know. I think you just gotta find something you love to do, then do it for the rest of your life...For me, it's going to Rushmore." Later on, Blume has decided that Rosemary is his Rushmore. I have to ask myself: What's my Rushmore? I hate to admit it, but I'm not sure I know. I wish I had the clear vision of a character like Max or Dignan from Bottle Rocket. Speaking of those two, it might be interesting to compare and contrast these two characters. Maybe that's a subject for next week's discussion! Tonight we had the first meeting of our new film discussion group. I'm referring to it as a Film & Theology discussion because I want to talk about theology, but I don't want to miss the "film" part. I believe that as Christians we can first of all appreciate art for what it is. Then, we can go on to talk about what the film may or may not say in relation to our faith. We started off this new group by watching Bottle Rocket, which was Wes Anderson's first feature film. Dignan, played by Owen Wilson, has big plans for he and his friends. They are going to start off as petty criminals, but eventually become a successful part of law-abiding society. ...keep extremely busy, it's working for me. I've got a whole new program. Bob and I get up at 5:30 every morning...[he goes on to talk about their three jobs]...we both feel much better about ourselves now that we're working hard. [a little later] I'm also coaching a little league soccer team called the "Hurricanes." They're mostly beginners, but they've got a lot of spirit and they don't let defeat get them down. They remind me of Dignan in that way. Say what you will about him...he's no cynic and he's no quitter. I'm usually so exhausted now, at the end of the day, so that I don't have time to think about blown opportunities or wasted time. How many people in today's society just want to keep busy so that they don't have to think too much? How many of us waste time staying busy so that we don't have to think about the time we're wasting? Anthony admires the little kids he coaches because of their perseverance, which reminds him of Dignan. Even though Dignan is slightly crazy "he's no cynic and he's no quitter." There's something endearing (dare I add respectable?) about Dignan because of the earnestness with which he lives his life. Even at the end of the movie, when the big heist has totally failed, he's in jail, and he finds out that the guy he looked up to has used him, he still feels like he's done something with his life. "We did it, though, didn't we?" are his exact words. We'll be meeting again next Sunday at 8:00 in my apartment in Pasadena. If you'd like to come be a part of the discussion, send me an e-mail. 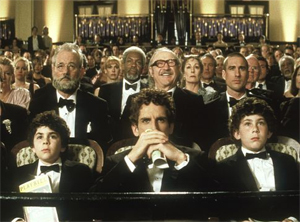 We decided to continue on with a Wes Anderson theme so next week we'll be watching Rushmore. Click here for a trailer. Finally, we come to our last category, which Niebuhr dubs the "conversionists." Excluding the cultural Christian group (Christ of Culture), the conversionists are the most hopeful about human culture. They view culture as corrupt and yet redeemable. Oddly enough, Niebuhr does not seem to give any argument against this view and most people seem to believe that this was, in fact, the view that he personally held. His son, however, reportedly said that he did not necessarily think this was the case. Overall, I think I probably fit into this type the best. In my concluding post, I'll talk about the thesis for my paper and why I think Niebuhr's typology can still be helpful for us today. The dualist believes that during our present lives there will always be this tension between culture and Christ—a tension that we could not escape of we wanted to. People in this group tend to recognize the pervasive nature of sin, but on the other hand, they tend to not question the absence of justice or the presence of evil in culture. Culture is seen as a restrainer and is not questioned as often. Or, in some cases culture is seen as something evil that can be ignored, which eventually results in antinomianism. Finally, dualism of this sort tends to associate sin so closely to creation that people mix up sin's affects on creation with creation itself. I will be writing a paper based on H. Richard Niebuhr's Christ & Culture this quarter. Niebuhr present five categories for the ways in which Christians choose to interact with culture. Chapter one has some interesting thoughts about the definition of both "Christ" and "culture." Niebuhr's basic thesis is that Christ is understood best in his relationship to God. Many focus on one of Jesus' virtues at the expense of others. The prime examples that Niebuhr discusses are love, hope, obedience, faith, and humility. Niebuhr insists that although all of these virtues help us to understand Jesus, "each is intelligible in its apparent radicalism only as a relation to God." (p.27) Jesus may be known for his great love, for example, but what is the focus of that love? Above all else, it is focused on God. It is only from that relationship that his love extends out to humankind (not to mention the rest of creation).